This light and concise read presents a fantastical, action-filled plot populated by relatable teenage characters. When the sixteen-year-old heroine with Jedi-like powers mutters, “I just have a really bad feeling” about something, her comrades had best take notice, and readers of Brandi Lynn Smith’s sci-fi thriller, The Recruit, should strap themselves in and prepare for action. The lead character, Kateen (aka Kate) Richmond, is not your average high-school girl. Her eyes are maroon—and turn red when she gets angry or emotional. She uses mental powers to turn on a television, stop a speeding bullet, elongate a racing automobile so it fits between two tractor-trailers, and make enemy guards go to sleep. She can also spot otherwise invisible people and, with something akin to Superman’s x-ray vision, is capable of “looking through structures.” In fact, Richmond might have too many powers, and new ones are revealed at the last minute when the heroine feels backed into a corner. Recruited into the elite X-Men-type Alpha Unit, Kate and other teens with special talents are put through all sorts of military and Jedi/Mutant-style training. There are mock battles and mind games meant to meet the threat from a sinister, elusive alien enemy from the newly discovered planet Ebony 9. The plot is further spiced up by concerns over traitors, conspiracy theories, prophecies, a lost artifact of supposedly great power, and “the Return” of something or someone—or some race—probably from Ebony 9 or some other world. It is all great, light fun and is written in the style of a young-adult novel. The sentences are short and the dialogue is simple, crisp, and to the point. The kids speak like teens, not teenage versions of adults. Kate’s story starts out slow and simple, is quickly ratcheted up—through an unwelcome sexual advance at a party hosted by a self-centered upperclassman and through a knife fight with a motorcycle gang—and then slows down into a familiar, relatively by-the-book recruiting/training/soldiers-bonding sequence that goes on a little too long before finally getting back into the real action. Other than occasional confusion about how to spell the name of one character (Zack is occasionally Zach), the book is free of gaffes and reads quickly and easily. The plot is clear and linear, and while some twists and surprises are telegraphed, there is enough built-in curiosity to keep pages turning. 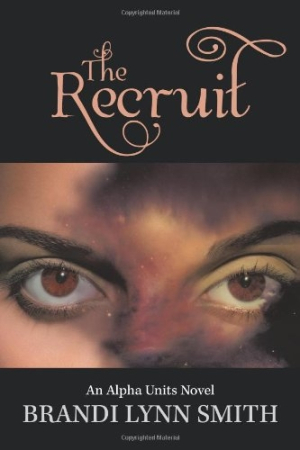 The Recruit is a quite delightful read, particularly well suited to younger audiences—including those who have not yet reached the ripe old age of its sixteen-year-old heroine. Better yet, the ending hints at a possible sequel.